Keeping this one - for a change - short and simple. Egypt's judicial system is, to put it mildly, severely inefficient, slow and its estimated 15,000 judges are extremely overloaded -- legal cases can drag on for years. Reforming the entire system represents a massive challenge, while its independence from the influence of the executive branch remains a prominent long-term demand. The appointment of a pro-reform judge as Vice President was translated, in part, as a sign of the policy priority this sector might end up experiencing from the Morsi administration. In addition, observers largely welcomed recent moves by the new Justice Minister to separate judicial inspection from the influence of the Ministry and the executive branch, until such a separation is fully codified into the highly-anticipated new judicial overhaul bill. 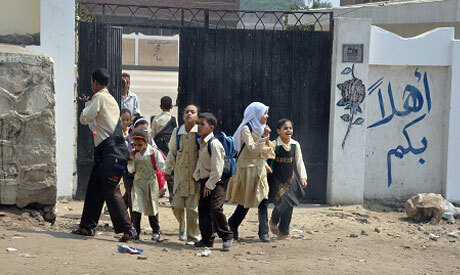 Despite efforts to increase the overall number of literate Egyptians, the country's population growth have largely kept stooped the percentage from rising. The second side is the actual number of people with any level of formal education. And despite handling nearly a combined 300,000 new students a year, only Cairo University out of all Egyptian Universities had managed to make it in and out of the bottom quintile in rankings of the world's top 500 univeristies. Note: this article has been edited since its initial publication to reflect the consideration of additional global university ranking reports. My brother is a banker. 20 years ago his legal adviser at the bank informed me that the judicial system in Egypt was riding on a bicycle but then became riding on a donkey with a limp!Again no solution offered! The thrust is illiteracy of one third of our nation we seem to be proud of it no body want to address it seriously.The only one who addressed it in his program for Prisedential election was Dr.Abol Fottoh he pledged to erase it within 4 years for the under 40. I have not seen any suggestion in the above essay how to eradicate it.Should we just pray. We have to change as a nation first.